Alustone, the natural marble composite panel but super light! 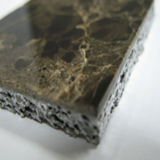 Alustone is a cutting-edge interior material which is a natural marble composite panel with aluminum foam back panel. The superior characters of Alustone including light weight and high stiffness are very attractive to a skyscraper building, remodeling building, yacht, elevator, etc. where light weight is highly required. Softest ever and shape memory. Waterproof. Made by new amazing technology but still Japanese traditional furniture. No core. Easy install.